I do like the look of this HP tablet. For the rumored $600 price tag, it supports an impressive feature list. Oh, and it supports Flash, has at least one USB port and a SD slot. 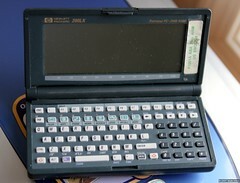 When I speak of PDA tech, I know of what I speak. 🙂 This is a picture of my first PDA. Before that I was a DayPlanner geek. This is actually a nifty bit of technology for the early 1990s. It has a 186 chip and I can get to a DOS prompt with it.